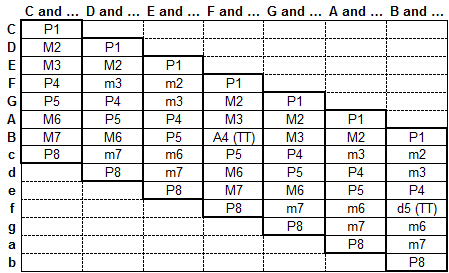 Diatonic intervals of a major key. current 15:45, 24 June 2010 449 × 273 (13 KB) Paolo.dL (talk | contribs) Correcting another typo. Now the table is guaranteed to be correct (see discussion). 14:48, 24 June 2010 447 × 273 (12 KB) Paolo.dL (talk | contribs) Correcting typo and adding reference to TT to fix inconsistency. (See discussion). This page was last edited on 21 December 2012, at 02:51 (UTC).